It is incredible what activity this little bird has rendered since, about 8 years ago, for still not fully understood reasons, its popluation had declined to less than a 1000 individuals. In present day it is estimated at only 250 individuals and the population is aging. The crucial countries all working together, the action plans, the number of dedicated websites, it is simply astounding. The Russians, Koreans, Americans, Japanese, Myanmars, Bangladeshi’s and Indians all assigned resources to save this bird. In our experience this is the definitive conservation species of 2014, a very questionable title. It is a 15 cm stint with spatulate bill. The breeding adult has a red-brown head, a neck and breast with dark brown streaks. Blackish upperparts with buff and pale rufous fringing. A non-breeding adult lacks the reddish coloration, instead shows a pale brownish-grey upperparts with whitish fringing to the wing-coverts. The breast and belly are white. This charismatic species has a very small population that is undergoing an extremely rapid population decline. Fledging success and juvenile recruitment are very low, the population is ageing rapidly. Resources and man hours are now required to prevent it from becoming extinct. Throughout history, it was first described in 1758 as Platalea pygmata, by the famous Swedish naturalist Linnaeus. He considered it a very small relative of the Spoonbill. 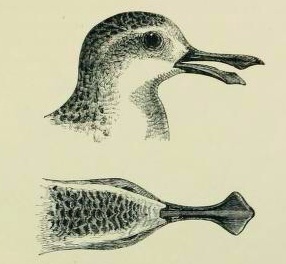 In 1869 Harting wrote: Notwithstanding the vagrant habits of the species which compose the present group, and the increasing researches of naturalists in all quarters of the globe, it is remarkable that a bird which was described more than a century ago by Linnaeus should still be one of the rarest and least-known. In 2000 in the Asian Red Book: “The spatulate bill of this species is unique among shorebirds, and is only otherwise found in the spoonbills (genera Platalea and Ajaia). For this reason, it is placed in its own genus Eurynorhynchus. Some authorities regard the development of such a bill as a relatively recent adaptation, and include the species in the genus Calidris, which in all other characters it closely matches. Nevertheless the bill is so unusual a feature that the interests of biological diversity are better served by the retention of the monotypic genus.” (In 2014 the name was officially changed in Calidris pygmaea). This species has a naturally limited breeding range on the Chukotsk peninsula and southwards up to the isthmus of the Kamchatka peninsula, in north-eastern Russia. It migrates down the western Pacific coast through Russia, Japan, North Korea, South Korea, mainland China, Hong Kong, Taiwan and Vietnam, to its main wintering grounds in Bangladesh and Myanmar, the latter being the most important wintering country with 84 recorded in 2007-2008, 73 in 2009, and 89 in 2010; 150-220 were estimated in the Bay of Martaban in 2010. In March-April 2010, a minimum total of 49 individuals were recorded along the coast of Bangladesh. Counts of up to 103 individuals at Rudong, China, in October 2011 and 106 in October 2012 are likely to have accounted for a substantial proportion of the global population. Already in the nineteenth century it was considered a rare bird. Now numbers have dropped from 2,000-2,800 pairs in the 1970s to an estimated total population of 500-800 individuals, indicating an 88% decline since 2002. Breeding success is very low: the species now has an ageing and rapidly declining population with little recruitment. In 2013 for the first time there was no decline detected at the core breeding area of Meinypylgino, where the population was stable at c.10 pairs. The breeding population in 2009/2010 was estimated at 120-200 pairs, roughly equivalent to 240-400 mature individuals and 360-600 individuals in total, although this is thought to be an optimistic estimate. It has a very specialised breeding habitat, using lagoon areas with crowberry-lichen vegetation or dwarf birch and willow sedges. The species never breeds further than 5 km from the sea shore. Breeding birds are very site faithful. It breeds either in single pairs or loose aggregations. During winter it prefers mixed sandy tidal mudflats with uneven surface and very shallow water and thin mud layer on top. Probably the most influential threats are habitat degradation and climate change along with the ever present human pressure. A great number of initiatives have been deployed or are planned. Protected areas are nominated throughout its range. Annual surveys are undertaken of breeding sites on Chukotka and over 450 adults and young have been ringed on the breeding grounds since 2000. In 2011, awareness-raising and advocacy activities including two trainng workshops took place in schools in China. We, at planetofbirds.com think the population of this enigmatic, charismatic, flagship species, will restore to numbers just under the amount in the Seventies. This is if pollution, including the rapid human induced climate change does not further accelerate and the breeding ground remains highly protected. In this particular case human intervention will result in a lasting positive effect.